Welcome back for Day 19 of our 31 Days of Horror series! We’re big fans of ’80s movies here at ItsJustAwesome.com, so we are fitting in FOUR reviews from this decade, instead of just three. 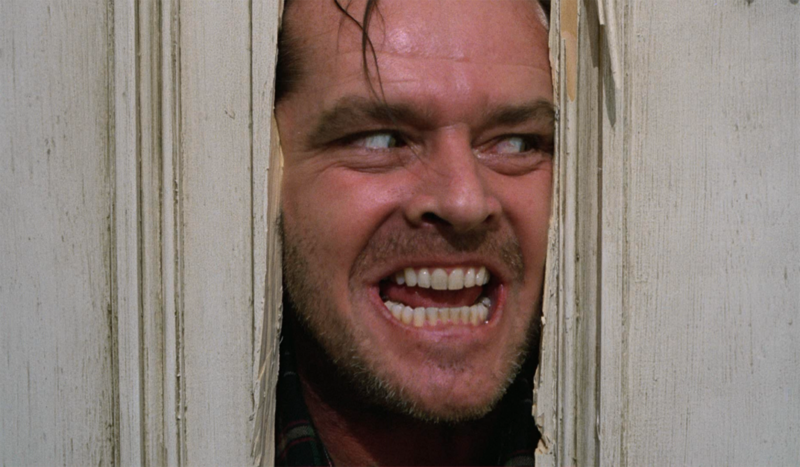 Today, we’re launching that exhibition in a big way with Stanley Kubrick’s horror classic, The Shining (1980). To say that this movie is iconic would be an understatement. It’s one of the scariest horror films of all time, and also one of the best. In fact, it’s probably one of my top 20 movies in general, horror or otherwise, which is saying a great deal (I’m usually a weenie about truly scary films). Jack Nicholson stars, in one of his best-remembered roles, as Jack Torrance–a man who is slowly overtaken by forces of unspeakable evil. The film begins with Torrance accepting a position as winter caretaker of the remote Overlook Hotel, where he hopes to find the peace he needs to work on his writing. For five snowy, isolated months, he and his family will be the hotel’s only inhabitants. At first, the Torrances enjoy the solitary quietude of the majestic Colorado mountains, but Jack’s son Danny soon begins to be haunted by gruesome premonitions. As it turns out, the Overlook has an eerie, unsavory history (to say the least): one of the previous caretakers went mad with cabin fever, and chopped his family to pieces with an axe. Through Jack’s own gradual decline into mania, and Danny’s increasingly horrifying visions, we start to suspect that the hotel itself is evil; it envelops those who enter with a dark, malignant presence. This movie will creep the bejeezus out of you. It’s a well-executed thriller, yes, but the creepiness is magnified times ten by the stunning visuals and profoundly jarring soundtrack. There isn’t much of a standard musical score to The Shining–instead we’re given something much more terrifying. Throughout the film, a cluster of bows scrape discordantly across their violin strings, and you’re left with the sensation that you might now know what it would sound like to hear someone’s fingernails rake down the walls of Hell. That might seem like an overly dramatic description, but the noise is REALLY FREAKIN’ UNSETTLING. It’s genius, really, because it puts the viewer immediately on edge, and doesn’t release you until the movie is over. The one thing that I find a little silly about The Shining is minor, but worth pointing out: Shelley Duvall’s cartoonish performance as Wendy Torrance. In both appearance and general movement across the screen, she is a combination of Olive Oyl, Tim Burton’s Corpse Bride, and a baby gazelle. I guess it kind of works for a horror movie, but it’s just odd to see when every other aspect of the film is so serious. Anyway, even Duvall’s goofy running and limp-wristed knife waving can’t tarnish this movie for me–it’s that good. Watch it, if you haven’t already…just don’t do so alone. Tomorrow, be sure to come back and check out my review of 1981’s The Fan, which features the always-classy star of my heart, Lauren Bacall (To Have and Have Not, The Big Sleep). Until then, it’s a great time to catch up on any 31 Days of Horror reviews that you might have missed! See you tomorrow.